Hampi is a small attractive village in northern state of Karnataka, known as a cultural hub in the Southern part of the country. Hampi has lot of temples, monuments, structures which has been restored and preserved by the UNESCO, and has been tagged as the World Heritage Center. One of its major kings Krishna deva raya was a pioneer in the development of Hampi, did major contributions in terms of wealth, literature, art and music. He constructed several cultural halls where music and dance were practised. Art forms like paintings was also hugely encouraged in Hampi and one can still find a number of wall paintings on the monuments. Speaking of festivities, there were regular festivals celebrated throughout the year, specially in the temples. One of the most celebrated festival was known as the Hampi Utsav or Vijaya Utsav during the king's time. After the kingdom came to the ruins, the Karnataka government named the event as Nada Utsav. This festival is conducted in the month of November every year, where lot of artiste, international tourists, musicians come from all over India to perform and enjoy. 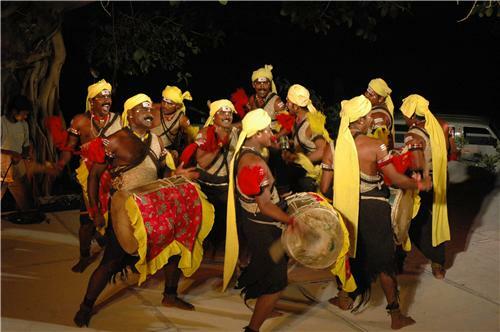 Major attractions in the form of traditional dance, theatrics, musical shows, puppet shows, spectacular fireworks and cultural processions combines to recreate the legacy of its royal heritage. As per the historians, this was the most spectacular festival of those times and the people of Hampi bring back the magic, by recreating everything during the festival time. The two kilometer path near the Virupaksha temple, which is also known as Raja Marg is decorated lavishly, with elephants, horses and men dressed in their military uniforms. Gopuras are posted along the roads of Hampi. Traders are offered tokens of gold coins and diamonds recreating the once world famous for open trade in stones. Classical dances, vocalists entertaining the guests with brilliant performances; are the cultural delights. This festival brings Hampi back to life and is celebrated by everyone in the middle of hundred years old rocks and ruins. Hampi sees a lot of visitors daily as it is a popular tourist hub. During the Hampi festivals celebrations, it turns into a sea of humanity visiting here to enjoy the cultural events set in the backdrop of magnificent ruins. Hampi was a prosperous kingdom with lot of temples and monuments during the Vijayanagar rulers. After the constant attacks by the Muslim rulers who had already conquered the surrounding areas, the Hindu architecture and culture showed considerable plight. Hampi was prominent place during those times, with temples known for their architecture, were the true cultural wealth depicting the subjects of Ramayana and Mahabharata and the Hindu Gods Lord Narasimha and Ganesha. Some of the other temples in Hampi have a mixture of Hindu, Muslim and Jain architecture like the Krishna Temple, Hazara Rama Temple, Pattabhirama Temple etc. Most of these temples are flanked with streets and bazaars all through the mandapas. The Lotus Mahal is a beautiful structure which is decorated by the Vijayanagar artists and was a religious place for the royal women. The Dhananayaka’s enclosure treasury, the Mahanavami Dibba carrying beautiful sculptured panels, variety of ponds and lakes. Recent excavations in Hampi have brought light to numerous palatial complexes, basement of several platforms, stone images, beautiful terra cotta objects and stucco figures that adorned the palaces of Hampi. 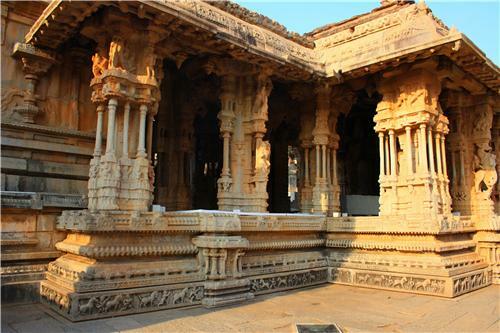 Thus the art and culture and heritage of Hampi is best treasured and maintained.